Photography has evolved immensely over the years. We started with simple pin-hole cameras, Polaroid’s and film-based models. Fast-forward to the present day and we have a new type of photography – drone photography! This article looks at the best drones for still photography together with some awesome tips and advice – enjoy! So what can the best drones for still photography offer you? How can they enhance your work? Using a drone for photography opens up a whole host of new possibilities. You can effectively reach places that were previously inaccessible. You can fly your drone high to capture amazing aerial shots. You can position a drone in places that your body couldn’t physically fit. The sheer creativity that a drone can produce is absolutely amazing. Imagine the scene – you are out in the countryside and a sweeping landscape unfolds before you. There are some interesting rock formations, wide golden fields and a gorgeous river. You can use your DSLR camera to take awesome wide angle shots of the landscape. You could then fly your drone up high to take still photos of the rock formations from above. Furthermore, you could fly your drone over the course of the river and capture some still photos from angles you wouldn’t be able to access. As you can see drone photography truly can take your work to a new level – this is why it is essential to know which the best drones for still photography are. What are the Essential Features of a Great Drones for Still Photography? Flight control is highly important. Imagine if you are flying a drone high up in a forest. You suddenly lose control of the drone and it comes crashing to the ground. That’s an expensive trip right there! Imagine if you have automatic controls or anti-collision features on your drone? Would that have resulted in the same incident? Probably not! Ensure that the drone you are purchasing has advance controls – most modern drones have anti-collision features to start with. Some drones even have automatic flight controls that allow you to follow a certain path or circle around objects – features such as these can make still photography a breeze. When taking still photography with a drone, you will 95% of the time be outdoors. When confronted with the elements, you need a drone that can withstand the pressure. Imagine that you have a flimsy little drone and you have flown it up high on a beach in Bali. A sudden gust of wind comes and you drone simply can’t battle against it! The inevitable happens and your drone is pushed out to sea and lost in the depths! You must purchase a drone that has powerful motors and blades, and is highly responsive. This will ensure that you can maintain control in difficult situations. The flight control range is the distance that your drone remote control will still work from. 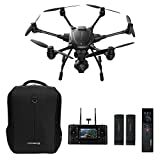 Most drones connect to their remote control either via WiFi, radio waves or Bluetooth. This type of connection obviously has a limited range – the further you move the drone away, the weaker or more unstable the connection becomes. When taking still photography with a drone, you need a decent control range. There is no point in purchasing a drone if it only has a control range of 10m for example. Look at the maximum range, and also read about other user’s experience controlling the drone. Obviously, camera resolution is an important factor. You do not want to purchase a drone that has a low-resolution camera that takes pixelated blurry photos! Ensure that you look at the megapixel resolution of the camera. Furthermore, ensure you check the focusing, advanced settings, and focal range of the camera too. Some drones are simply the frame and flying equipment – you can mount your own DSLR camera onto them – these tend to be much more expensive however than the drones listed below. By now you should have an excellent understanding of drone technology. You should have clear in your mind what you are looking for and what features the drone must have. Now we come to the fun part – the drones themselves! We have scoured the drone market and pulled together 5 of the best drones for still photography. These drones represent the ultimate in quality and features for the mid-range budget. There are more expensive drones that you could invest in, but you need rock star wages to purchase one! Therefore, we have selected 5 drones that we feel everyone could purchase – enjoy! The DJI Inspire 2 is an absolute beast and builds upon the original inspire model (which we didn’t think was possible!). We appreciate that this drone is at the higher end of the market, but for professionals, the investment would be worth it. Furthermore, this drone is just an absolute joy to use and you can have so much fun with it! The design of this drone is sophisticated and uses lightweight materials to make it easy to carry. The motors are sturdy and offer brilliant levels of propulsion and control. Furthermore, this drone features a dual battery operation – if one battery runs out, you can simply switch to the other one for a prolonged flight time. DJI have really gone all out in the camera department of this drone too. The Inspire 2 uses the latest CineCore 2.1 processing system and the camera can shoot in burst mode too. Finally, the controls and flight systems of this drone are spectacular. The Inspire features an advanced detection system and can detect objects up to 30m away. This really is a beautiful piece of kit for the serious drone photographer! Yuneec drones are right up there with the big boys of the drone industry. Their Typhoon series of drones is one of the best available in the market today. This drone is actually a hexacopter with 6 blades which allows for a much greater level of control. Furthermore, the design of the propellers and arms allow for easy release and changing of blades. Finally, the drone features folding arms and retractable landing gear, making it compact and easy to transport. What makes this drone stand out, is the camera. Yuneec have worked in conjunction with Panasonic to develop the GCO3+ 4K Camera. This superb camera features a 14 mm f/2,8 lens and can shoot photos at 12 megapixels and 4k resolution. With 4096 pixels and 25 frames per second the camera allows you make high-quality video recordings with realistic 4K images in stunning detail. The GCO3+ capture images and recordings in super slow motion at 120 fps and with 1080p video quality, plus it has a 360° rotation function for panoramic images. First and foremost, the Phantom 4 looks awesome – it oozes style and sophistication. That’s not what makes it such a superb drone, however! Let’s first talk about the camera. Shooting at a whopping 60FPS and 4k resolution, the quality of its photos are magnificent. Furthermore, the camera can shoot in burst mode and features a mechanical shutter. Finally, the camera features an updated transmission system which allows for a greater level of control. For photographers, this drone also features some cool flight modes which allow you to experiment with different photo types. The three main modes are Position, Atti Mode, and Tripod Mode. Tripod mode, for example, limits the drone’s speed to 4mph allowing for fantastic and stable aerial shots. Alternatively, Position mode provides tracking and obstacle detection when flying through tricky areas. We felt the combination of high-quality camera and advanced flight capabilities really puts this drone up there with the other top contenders. The Mavic Pro is one of the smallest and most portable drones in this list. Don’t let its small size fool you, however! This drone is hugely capable and has an array of fantastic features. The camera is connected via a 3-axis gimbal and the resolution is a fantastic 12 megapixels and 4k ready. Furthermore, this drone is extremely robust and has a myriad of safety features that will ensure it does not receive any damage. Aside from the design and safety, the Mavic Pro also has some superb flight features. For example, this drone features the Active Track system which allows the drone to follow a specific person or object. Furthermore, you can switch to tripod mode which slows down the speed of the drone and allows you to take smooth photos whilst moving. Finally, this drone also works with the DJI wireless goggles so you can literally put yourself in the driving seat and view the drone from a first-person perspective. This gives you much greater control and can allow you to take exactly the photos you want. We feel that if you purchase any of these drones, your still photography could improve greatly. These best drones for still photography are robust and packed full of awesome features. If you are serious about your photography, the initial investment will be worth it! The fun you will have, and the photos you can take will bring you hours of joy. One final point to note is that you should always stay up to date with drone piloting laws! Ensure that you have checked where and when you can fly your drone. Furthermore, ensure that you have asked permission if you are flying over private land. Drone laws are becoming increasingly strict and you do not want to risk legal action if you are trespassing or flying over a regulated airspace for example.